The idea of an assembly line to build cars came to Ford when he saw the disassembly lines used to process meat at the Armour and Swift meat packing plants. A Michigan man who envisioned making automobiles for all Americans created one of the great American industrial success stories with assembly lines and workers' incentives. 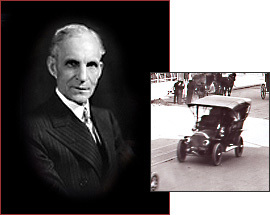 While Henry Ford was not the first to attempt the production of low-cost, reliable automobiles, he was the first to make cars affordable to average Americans. Born into a family of Michigan farmers in 1863, Ford quickly developed a dislike for farm labor. As a mechanically-inclined young man, he built and drove racing cars. It was not until he was forty years of age that he incorporated the Ford Motor Company in Detroit. In 1908, the Ford Company unveiled the Model T, a four-cylinder, 20-horsepower car that cost between $825 and $850 (c. $15,500-$16,000 in 2003 dollars). Developing an assembly line mode of production (like Oliver Evans's flour mill), Ford was able to decrease the price eight years later to $345-$360. Ford's output grew from just over 32,000 cars in 1910 to nearly 735,000 cars in 1916. His Highland Park and River Rouge factories would become famous for their low-cost, standardized mass production. Obsessed with wasted worker motions, Ford divided labor into small, specialized tasks, and installed conveyor belts to carry parts into the assembly lines in 1912. The system became one continuous, moving chain by 1914. Ford was said to have been inspired by the animal "disassembly" line of Chicago's meatpacking operations. These production techniques further lowered unit production costs and allowed Ford to thrive. Workers disliked these trends toward repetitive, machine-like work, and many of them quit. Ford shocked Detroit in 1914 by initiating the $5, eight-hour day. It was an instant doubling of pay, at least, and for less work. Thousands of aspirants showed up at Ford, ready to work under the newly generous terms. By the end of the Model T's run in 1927, fifteen million had been built and sold. The assembly line raised the standard of living for American families and contributed to the rise of the American consumer economy after World War I. By the time of his death in 1947, Ford had been mythologized on an international scale despite outcries against the anti-Semitic articles in his company paper, the Dearborn Independent, and his outspoken opposition to Franklin Roosevelt's New Deal policies. In the end, Ford was an innovator who changed the nation, but failed to evolve his views with the rapidly changing times.